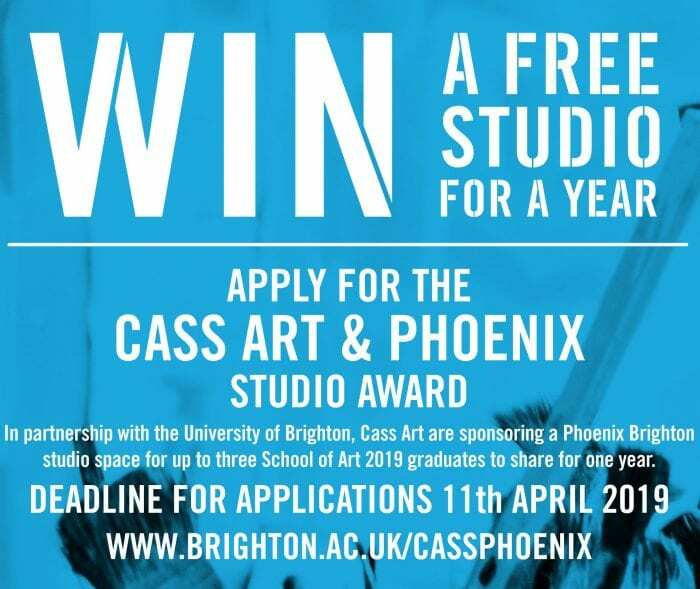 School of Art final year students have the opportunity to apply for this award which sees Cass Art sponsoring a Phoenix studio space for up to three 2019 graduates. The University of Brighton, Cass Art and Phoenix Brighton join forces for this annual award for School of Art final year students. Winners enjoy free shared space for one year at the Phoenix Brighton gallery in Waterloo Place, Brighton. Commitment and ambition to your professional practice. Engagement with current contemporary practice. Willingness to participate in public events, including the annual Open Studios event in May and occasional studio visits at Phoenix Studios. Commitment to taking part in discussion and critical debate. Willingness to be part of a lively community of artists. Commitment to spending the majority of your working time actively using the studio space. Showing how your practice will benefit from the provision of a free studio space at Phoenix. Complete the following application form and return to artadmin@brighton.ac.uk by 11 April 2019. Alternatively, log into studentcentraland complete the application form in the School of Art area. This entry was posted in Design and craft, Fashion and textiles, Fine Art, Graphics and illustration and tagged cass art, Pheonix. I am currently on MA Craft. I would welcome the chance to further my craft practice by being part of the creative community at The Phoenix. I am a Brighton resident who has been part of the AOH for the past 10 years. I am absolutely passionate about the rich creative diversity of this city. Hi Sandy – if you are interested in this you would need to apply directly – follow the links in the post. Good luck! Thanks Kate. I have just completed the application.